Have you ever gone to the gun store to buy ammunition and been faced with the task of choosing which would be best to defend your life? Have you encountered an online discussion about ammunition, with everyone using something different and all of them seeming to be right? Have you wanted someone to explain defensive ammunition in terms you could understand, and in a way that would give you the power to make your own ammunition choices? 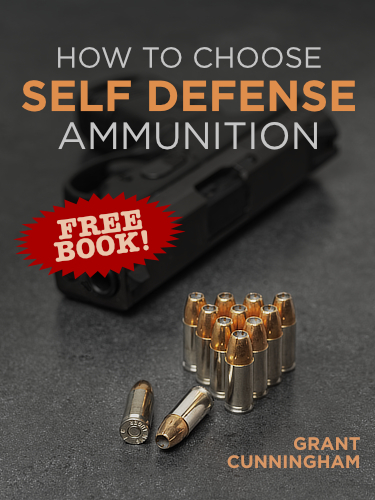 How To Choose Self Defense Ammunition is the 72-page “all in one book” you need to make you confident in picking the best ammunition to defend yourself and your loved ones! In this book I take everything I’ve learned about ammunition over a lifetime of shooting experience and explain it in factual, understandable terms. Once you’ve read How To Choose Self Defense Ammunition you’ll no longer wonder how ammunition works or what criteria you should use to narrow down the choices — you’ll know! How Do We Judge Effectiveness? No matter what defensive firearm you have, no matter how long you’ve been shooting, this book will teach you what you need to know to make the most effective ammunition choices! How To Choose Self Defense Ammunition is a full 72 pages of great information, and is available in Kindle, iBook, and PDF formats. It’s FREE with my compliments! Download your copy today! Hey Buddy!, I found this information for you: "How To Choose Defensive Ammunition book". Here is the website link: http://www.grantcunningham.com/information-store/choose-defensive-ammunition-book/. Thank you. Fill in the information to get your FREE download link via email! I hate spam too, so I don't share your email with anyone!